Since 2012 the de facto autonomous region of Rojava in northern Syria has established a political system called democratic Confederalism, an ideology closely related to anarcho-syndicalism. 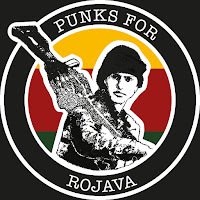 During this lecture Martin Shukevich from the network Punks For Rojava will go through the historical background, the present situation and the ideological basis of the society in Rojava. 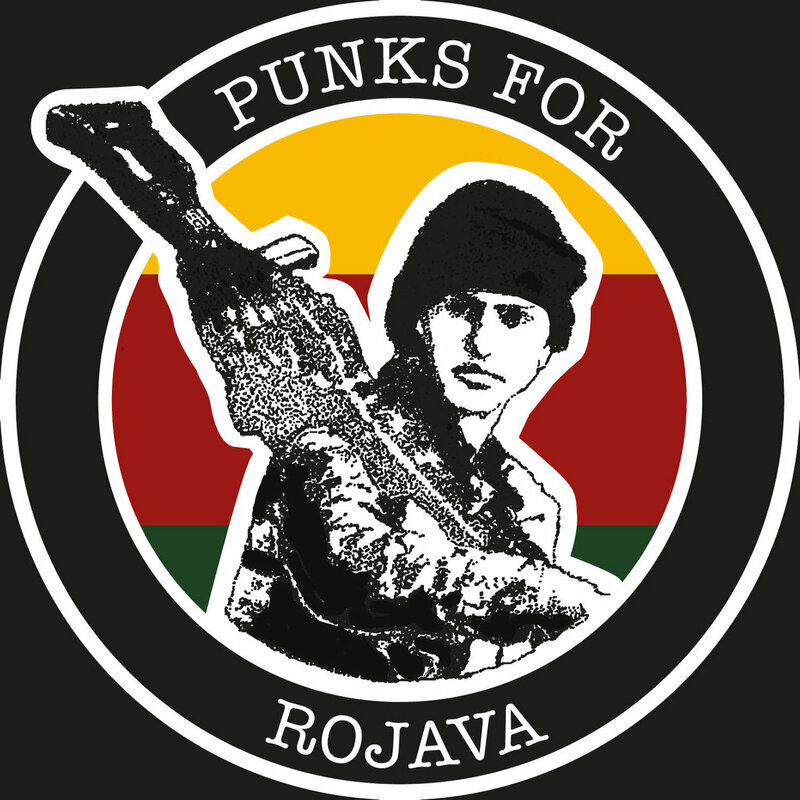 There will also be information about Punks For Rojava and what you can do to help out. The lecture will be in English. On the info talk activists from Vienna will explain about the ongoing mobilisations against the EU-summit in Salzburg on September 20th and the planned Counter-summit in Vienna the weekend afterwards. In July 2018 the presidency of the EU Council will be passed over from Bulgaria to Austria. In this context an informal summit on the issues of "internal security" and "control of illegal migration" will take place in Salzburg on 20th of September. For the conservative and right-wing government of Austria this means a possibility to carry its own politics of national isolation and social control to an European level. In Austria reactionary tendencies get stronger and stronger. Specifically in the means of isolationist policy and the rise of nationalist, right wing movements Austria has a leading role for a long time. Not later than 2015 Austria started to be a driving factor within the process of aggressive actions against immigration. An example for that is the „closing of the Balkan route “, that Austria was significantly responsible for. In Salzburg we want to fight for a supportive society. A society, that can’t be planned by the rulers, but only against them. We invite you to come to Salzburg and accompany us part of that way. Together we want to make a clear statement against the far -right as well as the authoritarian management of the existing. With a revolutionary perspective we want to reach beyond the contradictions of society. When the leaders of the European governments meet in Salzburg, we will be there as the alliance of the many. 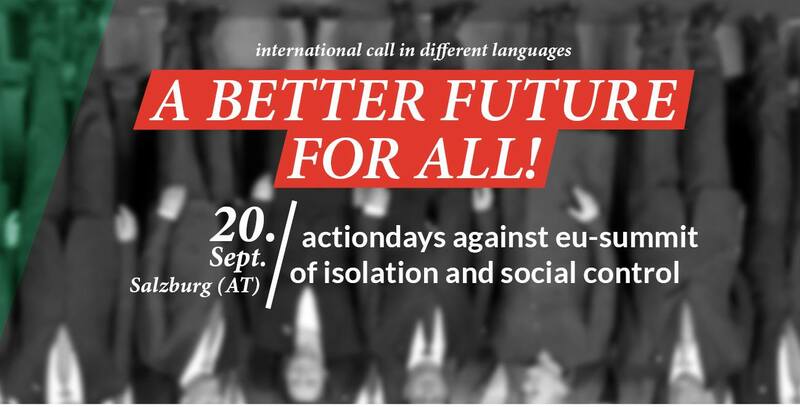 All our different struggles have something in common: A better future for all is possible beyond capitalism only!Following the protest in Salzburg, we invite you to join the Counter Summit for Solidarity and Safety for All in Vienna from 21st to 23rd of September. We plan a three-day gathering with workshops, panels and time for informal exchange. We want to challenge their notion of security and develop strategies for organizing ourselves in our cities and neighborhoods.